One of the most popular and versatile interior decor styles, the Transitional style is elegant and harmonious, drawing on the best of both traditional decor and contemporary looks. This school of design offers both the warmth and classic appeal of traditional homes, but updates the look with contemporary clean lines. Streamlined silhouettes and gentle curves create a sophisticated atmosphere that strikes a nice balance between casual and formal, masculine and feminine. Furniture such as chairs, tables and sideboards will feel familiar and comfortable in that they draw on traditional furniture, but the profile, finishes and upholstery will be pared down to give that contemporary edge. The furniture will create interest through the use of high-quality materials and crisp and strong design, like this Alden Parkes dining chair in our online store and the San Maria gray Transitional console below. 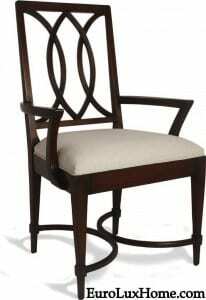 There are no fancy curlicues and frilly or ornate carvings and embellishments in the Transitional style! The color palette tends to be neutral, including cream, taupes and browns, gray, and grayed out greens and blues. 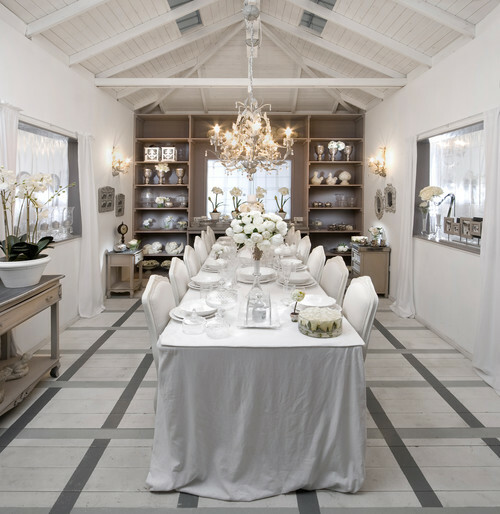 Monochromatic color schemes are tonally layered to create interest without visual clutter. The understated effect might be given a hint of color with a few artworks or accessories, such as a bold jewel color or a tangy citrus tone or a pretty pastel on a throw pillow, lamps, or vase. But this is kept to the minimum rather than having many pops of color punctuating the space. This bold red Jonathan Charles wine table is a perfect example of Transitional style. Textiles and upholstery are usually a solid color or very subtle design, rather than a big or fussy pattern. The design interest comes from textures! Fabrics for upholstery and soft furnishings often combine textures including natural fabrics, slubbed linens and coarse weaves, and the mixture of matte and shiny surfaces. In this way, though the neutral colors might be the same, the effect is layered. This creates a lot of depth and an inviting mood. 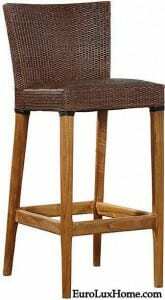 This Furniture Classics bar stool with a chocolate brown weave is a perfect example of the textured neutral look. Displays of ornaments and artwork treasures are usually fairly restrained, with a well-edited display of a few pieces that serve as focal points, rather than the more traditional approach of displaying a lot of pieces across many surfaces. 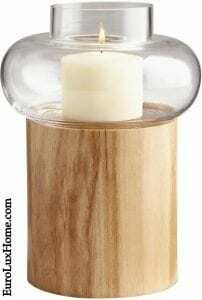 Strong, simple and serene are the watchwords for this light and easy Transitional decor style. We have many beautiful pieces of high-quality Transitional style furniture and home accessories in our online store, so browse around and get inspired! 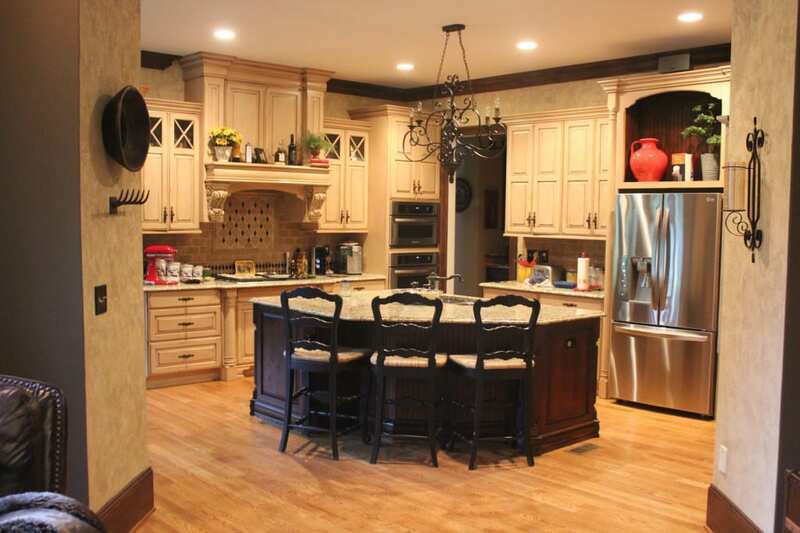 Do you like Transitional style? 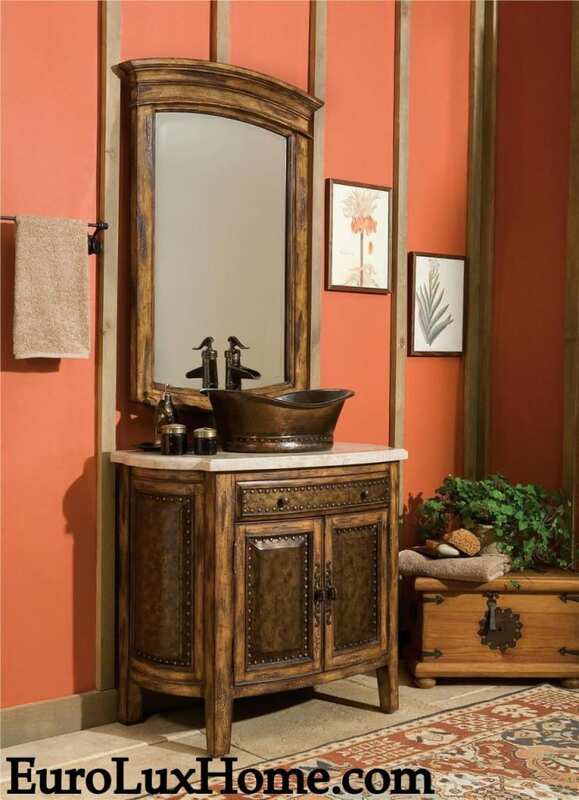 Leave a comment in the comment box and tell us about your Transitional style decor! This entry was posted in Learn History & Styles and tagged Alden Parkes, barstool, console table, dining room, High quality new furniture, home decor, home decorating, home decorating trends, interior decor, interior design, Jonathan Charles, living room decor, Transitional on April 11, 2018 by admin. 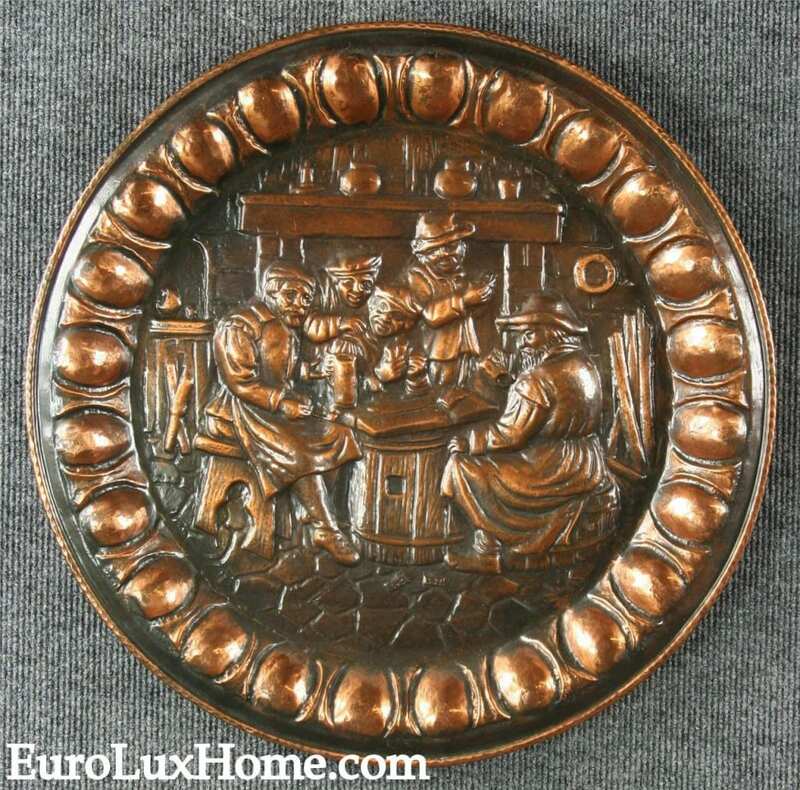 We have been selling on Houzz.com for less than two years but we’ve already found an enthusiastic following of home decor lovers who are quick to snap up our antiques imported from France, as well as our high-quality and hand-crafted antique-inspired furniture. We already won several home decor honors from Houzz including a Best of Houzz award for our customer satisfaction and service. So I thought that for today’s blog post I’d share with you three of the most popular items we’ve been selling recently on Houzz. 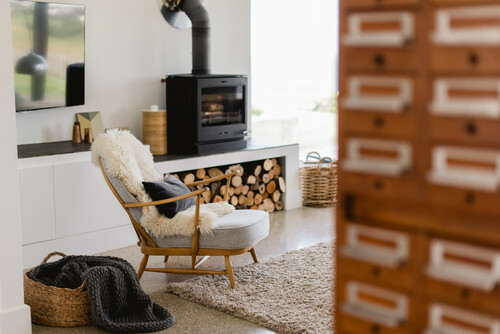 It’s a good way to take the temperature of the kind of things that Houzz folk are interested in right now in terms of home decor. Leather Sofas and settees and leather chairs are very popular with the style-wise Houzzers, probably because leather upholstery looks good with any style of decor and stands up to tough punishment in daily wear. 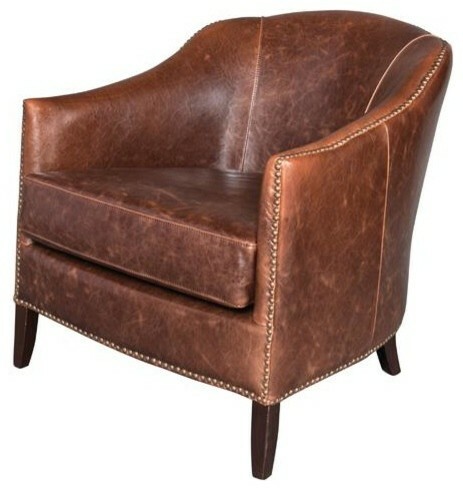 For example, this elegant but comfortable new Madison leather accent chair, superbly crafted with a solid wood frame featuring hand-applied nailhead trim. The weathered brown leather gives a classic aged effect. 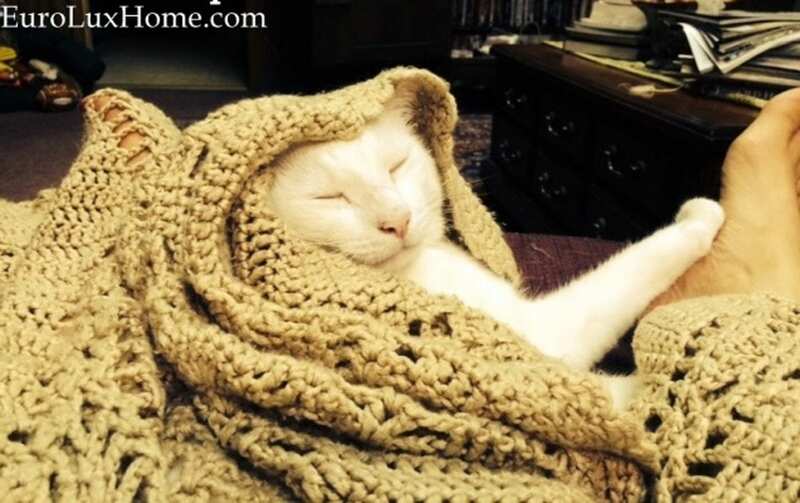 All you need is a good book or the remote control and a glass of wine and you are settled in for the evening! Our new Aubusson hand-crafted throw pillows are also being snapped up left and right. We have many different designs in our wide selection of Aubusson throw pillows but they all of exceptionally high quality and craftsmanship. 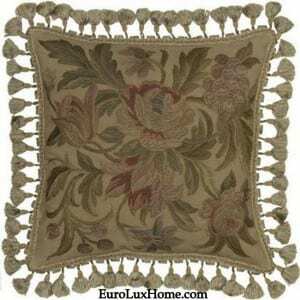 This 20″ x 20″ hand-embroidered throw pillow in traditional Aubusson style is a good example. 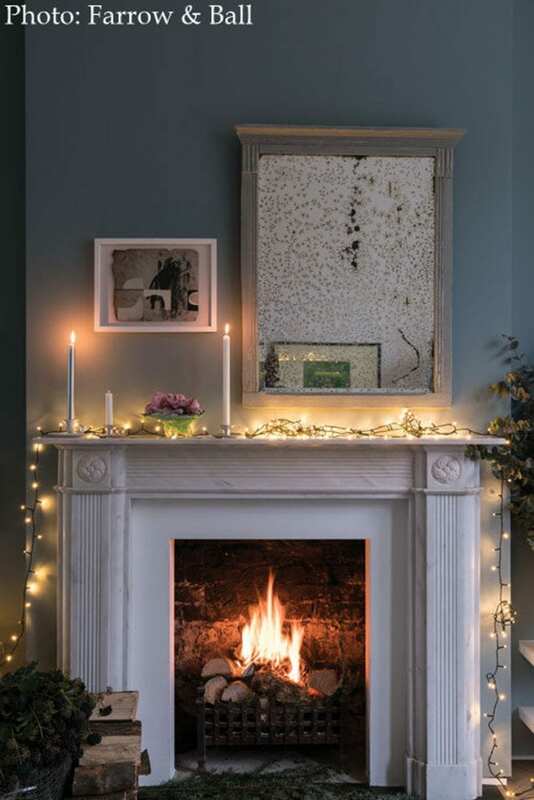 The large embroidered flowers are perfect for a French Country living room or bedroom, and the pretty design is set off by a luxurious frame of green and bronze tassels. A zippered velvet fabric and a down and feather insert add to the comfort! A set of handsome throw pillows always adds a wonderful decorative touch to a room and the design of the pillows can really help pull together a color scheme. 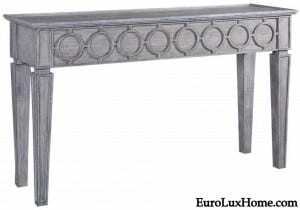 Design savvy Houzz fans are also buying a lot of console tables from us. 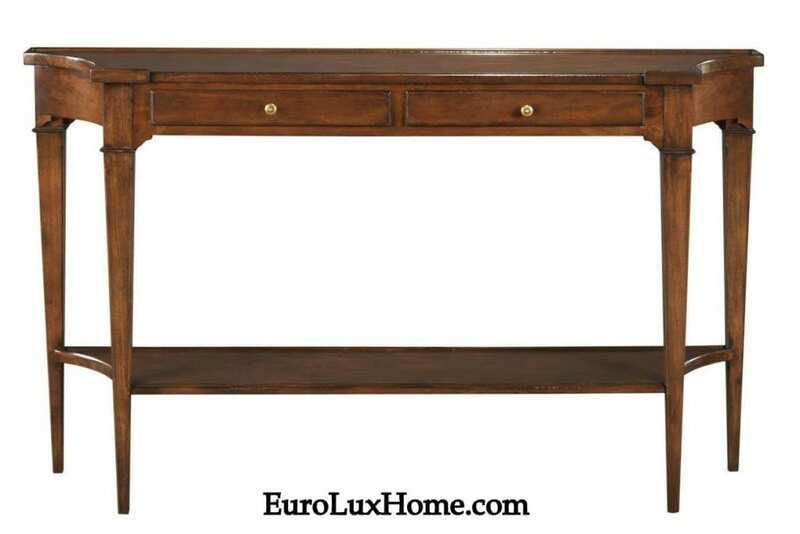 A console table is so versatile and it can be used in many different ways in every room of the house. It can be a convenient storage table in a narrow hallway, a beautiful display table placed against the wall in a living room, or it can be placed as a visual divider between different areas of a room. One of our most popular console tables is this gorgeous solid wood Woodbridge Marseille console table with a hand-waxed cherry veneer. I think that a good leather chair or sofa, attractive throw pillows and an eye-catching console table are all practical and beautiful investments in any home. 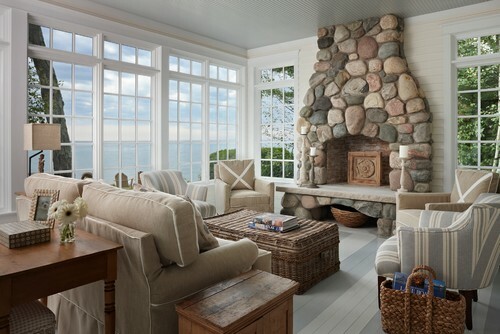 Apparently the Houzz community agrees! What do you think? 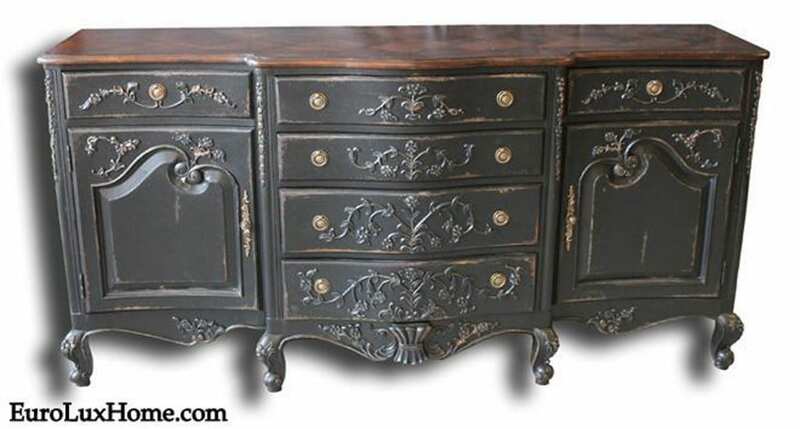 This entry was posted in Home Design Ideas, News and tagged antique inspired furniture, console table, essential furniture, high quality reproduction furniture, home decor, home decor accessories, home decorating trends, Houzz, Leather furniture, throw pillows, trend report on February 22, 2016 by admin. We sell quite a lot of new and antique marble furniture. A buffet or nightstand with a marble top is always popular but we also have a nice range of sink chests with marble tops. We love the marble effect in decor and it seems like we’re in good company. Many design magazines and other decor media are saying that marble is very on trend right now. Certainly this month’s High Point Market – a huge and influential furniture market – showed a lot of marble finishes including marbled paper effects. We think marble never went out of fashion, it’s been a design classic for centuries! But it’s great to know that it’s back in vogue again, whether it’s genuine marble or marble looks on everything from wallpaper to textiles. Here are some ideas of how to enjoy this elegant material in your home, starting with the real thing! 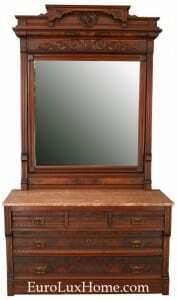 This fantastic 1890 American mahogany antique vanity or dressing table in the Eastlake style that we have in stock right now is topped with rose or red colored marble. The marble is practical but it also gives an upscale look as well as a pretty burst of vintage color. You might also enjoy seeing this blog post about how our customer Kathleen made creative use of an antique French marble-top nightstand in her kitchen. The white marble print duvet cover from Safe House USA looks incredibly convincing but it’s really printed on a sanded poplin fabric. 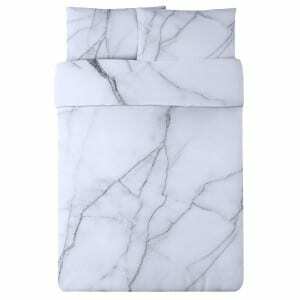 The marble pattern looks fresh and airy and I think it could go with many traditional bedroom styles as well as with a more modern bedroom. 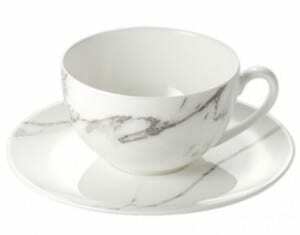 In the morning, you’ll want to be woken up with a cup of tea sipped from this Dibbern Carrara teacup. Carrara is the Italian city famous for the marble quarried there, and this cup is part of the Carrara range of fine bone china tableware with the subtle marble design. 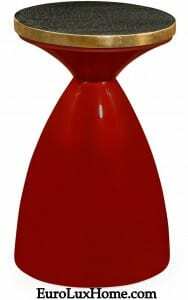 It’s made in Germany and sold by Dibbern retailers in the United States. 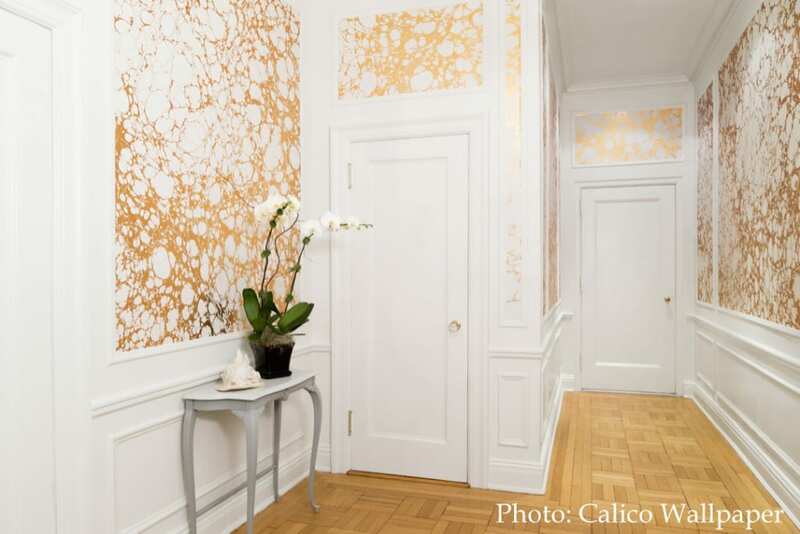 You can even find faux marble wallpapers, although I think it’s hard to beat this beautiful marble effect by Calico Wallpaper. I’ll keep looking out for marble finishes in home decor and if you spot the marble look cropping up somewhere unexpected, tell us in the comments box! 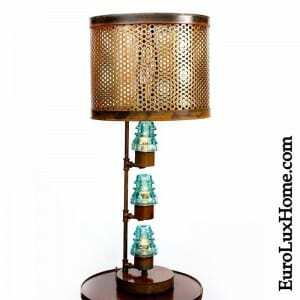 This entry was posted in Home Design Ideas and tagged 2016 design trends, Antique Furniture, creative home decorating, design ideas, design inspiration, home decor, home decor accessories, home decorating trends, interior decor, marble on October 31, 2015 by admin. A while ago I wrote a post on traditional painted checkerboard floors and how to paint a floor. But the checkerboard design was just the beginning. 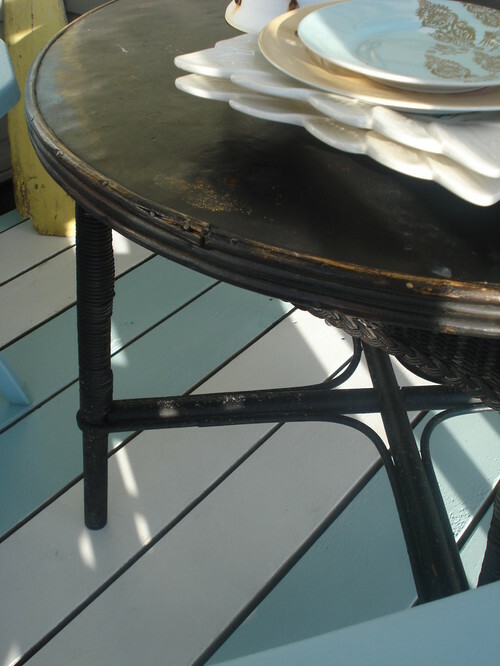 I’ve also seen some great ideas for other styles of painted floors. Some can be a bit whacky and perhaps too outrageous for most of us. I mean, you look at the floor every day and you need to be happy with your floor treatment for years, so you might get fed up with the “urban graffiti floor” look quite quickly! But I also found some classic designs that give a beautiful look without swamping a room. 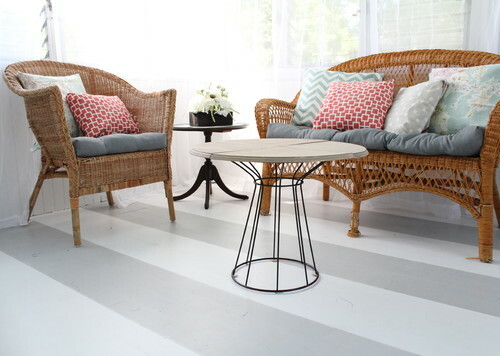 Stripes are very traditional – they are one of the painted floor styles that would have been seen way back when. (Because decorative painted floors are not a new idea in decor… they were a popular feature in American homes as long ago as the late 1700s.) The simple painted floorboards in this coastal cottage style room look clean and fresh. Here is a similar look on a deck of a different house. It would work well in any porch or sunroom too. The nice part about painting each individual plank is that it’s a much easier job! You don’t have to figure out how to line those stripes up so they aren’t wobbly. Or how about this elegant plaid painted floor? 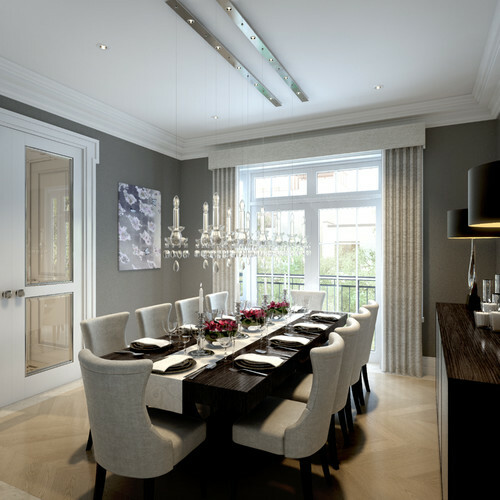 This otherwise quite simply constructed dining room is given heaps of charm by the grey plaid design on the floor. Because the floor is painted in similar tones to the walls and other decor, it blends in without looking noisy. Chandeliers always kick a dining room up a notch too… but I’m biased because I get to see and handle so many gorgeous antique and vintage chandeliers in our gallery each day! I’m guessing that a lot of people look twice at this bathroom’s painted chevron stripe floor. They probably assume it is a carpet or rug at first glance. The pattern wouldn’t look out of place on a textile, so I think that’s why it works. Also, the chevron is slightly irregular, which tones down the visual punch. If all the zig-zags were the same width, it might look a bit like old-fashioned TV interference! 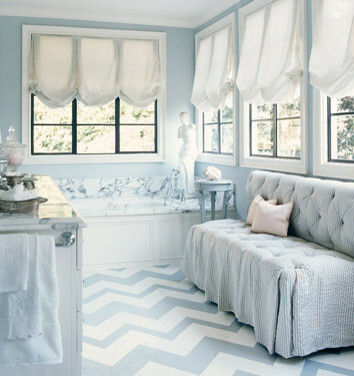 As it is, the painted chevron floor looks light and pretty and a bit playful against the otherwise formal decor with a marble bath and swagged drapes. If you want take it up another notch – pick a stencil! 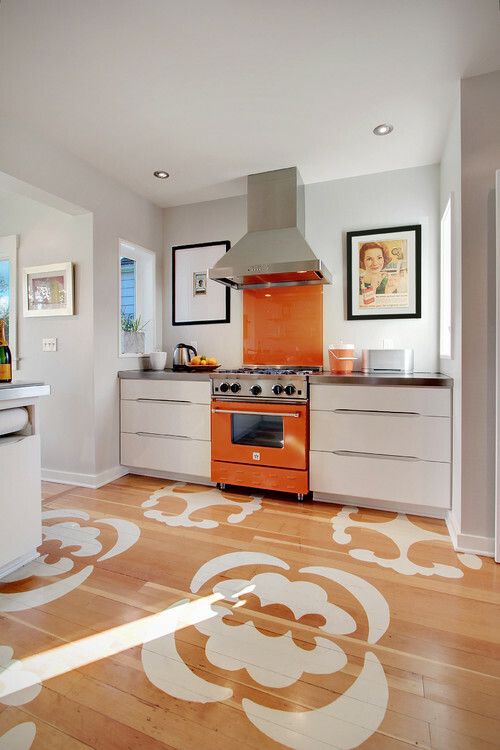 The large stylized flower pattern stenciled on this vintage kitchen floor covers up damage to the original hardwood flooring. The lovely honey tones of the fir wood floorboards still show through, but the stencils disguise the damaged sections. By the way, the original kitchen had a huge 1950s-style stove, but although the new owners couldn’t keep that, they did keep another memento from the past. The wall art came from old newspapers the owners found in the cabinets – they tore out some pictures to frame. How cool is that? If you have painted floor designs in your home, we’d love to see the pictures! You can contact us at this blog or just show us your photos on our Facebook page. This entry was posted in Home Design Ideas, Restoration Tips & Tricks and tagged creative home decorating, home decor, home decorating, home decorating trends, interior decor, interior decorating resources, interior design, painted wood, Replacing Old Floors, Stencil, wood flooring on November 19, 2014 by admin. Painted wood floors add such a lot of character to a home and a traditional checkerboard painted design can be a very effective way to cheer up worn wood floors. Recently I mentioned that we were invited to join the Houzz marketplace. 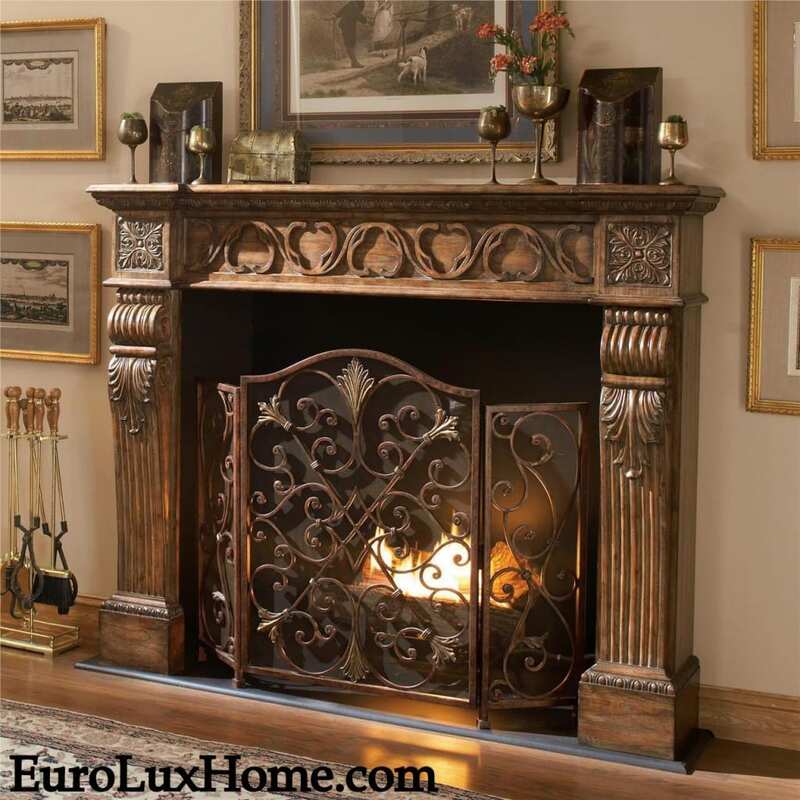 (We’re at EuroLuxHome on Houzz.) This means I’ve been spending a lot more time on Houzz answering customer questions, so I get to see all the great home decor photos flying by on the screen! Some of my recent favorites show how a checkerboard painted design on a wood floor gives a room an instant facelift. Doesn’t this neutral checkerboard design in a traditional bathroom look fresh and elegant? Although painted wood floors might seem like a modern idea, they are actually a traditional choice. 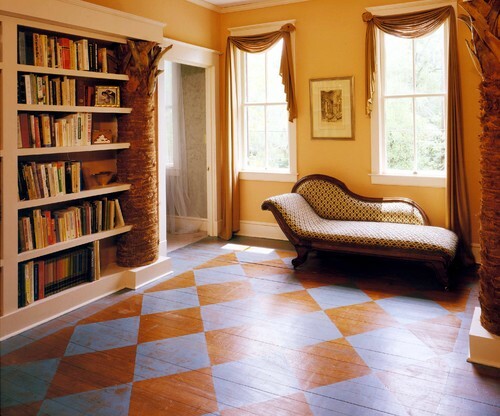 Painted floors featuring decorative patterns were popular in American homes by the late 1700s. Often they replicated tile designs, and the black and white painted checkerboard pattern remains a classic choice for painted wood floors. But you don’t have to stick to black and white and neutrals. This smart red and green painted checkerboard floor adds a little color to the mix! 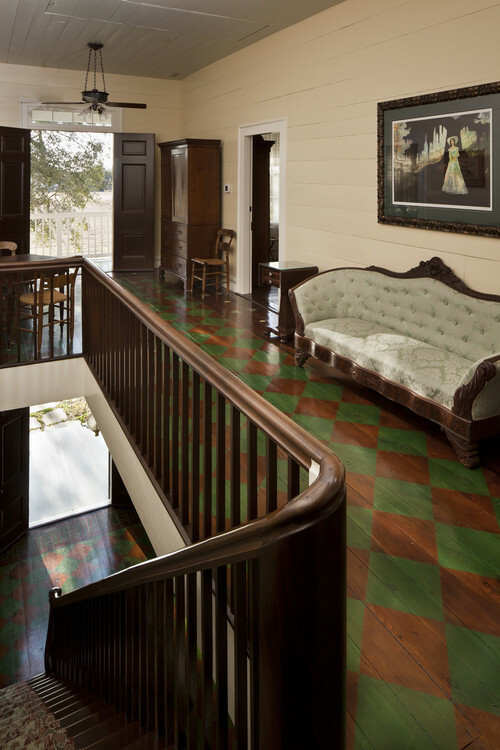 The floor is in a restored 1850 plantation house in Texas. The bold colors might be slightly strong for a living room, but they are a good choice for a hallway like this as they create a sense of energy and movement as you travel between rooms. This Charleston, SC, room is gloriously inviting! Notice how the softly distressed blue and honey-colored checkerboard pattern painted on the floor doesn’t go right up to the edges. The plain border around the edge gives the illusion of an area rug. The border also creates a breathing space for the eye – a brief transition before you pass into another room with a different floor design. Also notice the real Palmetto Trees in the bookcases! Crazy, huh? Traditional Entry by Bryn Mawr Design-Build Firms E. B. Mahoney Builders, Inc. If you don’t want to paint your floors, try a wood stain instead. This splendid entryway in Philadelphia has a diamond or checkerboard floor pattern, but in more subtle wood tones. The painted checkerboard floor look works for every style of traditional home and for modern homes too. If you want to try it for yourself, this helpful Houzz tutorial on How to Paint Your Hardwood Floors should get you started. This Old House also has a detailed How to Paint a Floor tutorial with specific instructions for a painted checkerboard floor design. This entry was posted in Home Design Ideas, Restoration Tips & Tricks and tagged creative home decorating, home decor, home decorating, home decorating trends, interior decor, interior decorating resources, interior design, painted wood, Replacing Old Floors, Stencil, wood flooring on September 24, 2014 by admin. I know many of you don’t decorate based on trends. 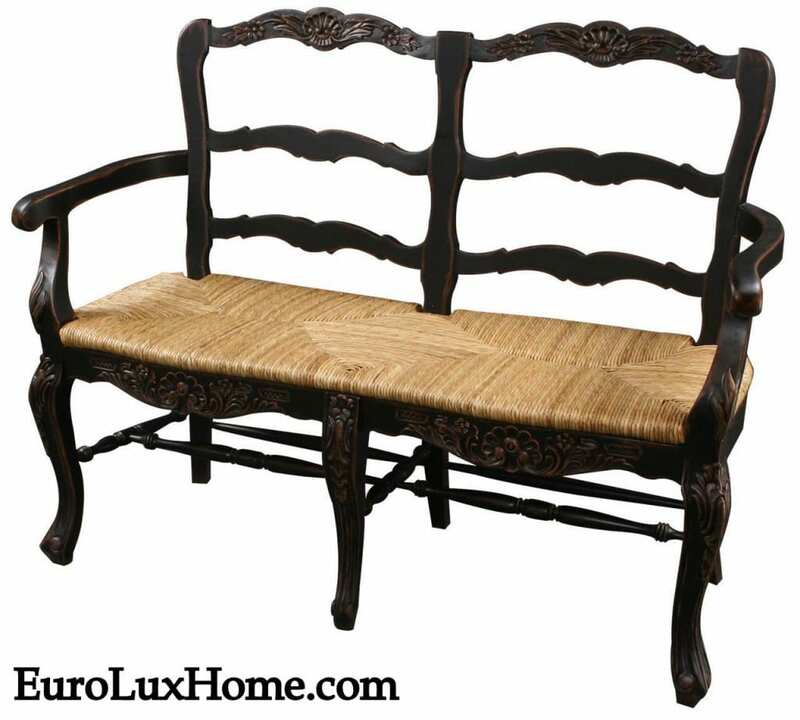 You buy antique furniture because you love its look and appreciate its high quality and value. 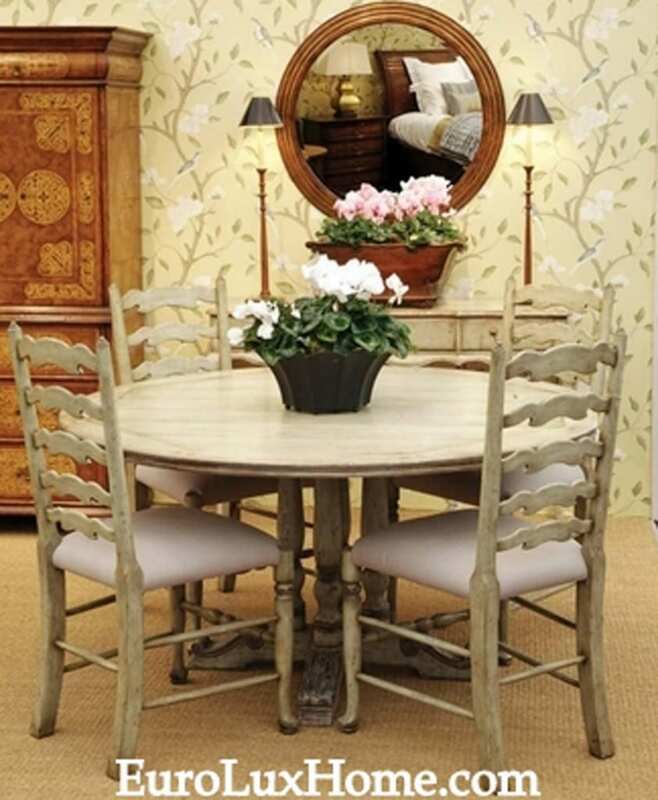 Still, I was excited to see antique furniture made the list of House Beautiful’s “10 Home Decorating Trends that will be Hot in 2013.” And it made me want to look into other 2013 design trends to see how fine antique furniture and accessories might fit into the picture. 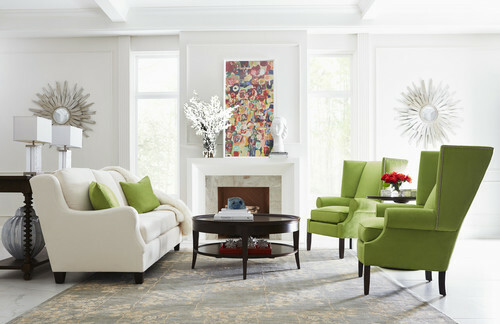 The renowned Boston Design Center issued its 2013 Trends Report, and again I noticed traditional furnishings making a comeback. BDC devoted an entire category to “The Classics,” summed up as “tailored shapes, tasteful and refined, polished surfaces, perfectly modern.” Many fine French antiques and vintage pieces fit this description, such as this beautiful upholstered 1950s Louis XV arm chair in walnut. Another candidate for BDC’s “The Classics” category? This fab French mid-century modern sideboard. BDC also devotes an entire section to “pattern” trends, and they predict stripes, floral prints, and figural patterns will be big in 2013. Other design blogs also have predicted a comeback of animal prints, but with a whimsical twist — such as in this reproduction French bombe commode with a sensational zebra stripe! 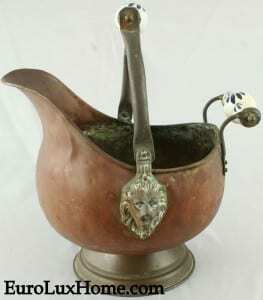 Designer Melissa Rufty says she’s “crushing on brass” for 2013, and certainly many antiques used brass hardware. If you like more bling, there are a variety of high-quality reproduction pieces that incorporate brass or even gilt elements for the ultimate shine. This particular console table not only includes the brass elements predicted to be hot but also homes in on the classic themes predicted by BDC. Designer Leta Austin Foster says “enough with the plain” in the House Beautiful 2013 trends slideshow and calls for “pretty, classic fabrics.” Again, you can look to vintage to fill the bill, as in this gorgeous French velvet table runner from the 1950s. In terms of color, all the major trendsetters see blue in the future. One obvious way to add pops of blue throughout your decor is by displaying classic Blue Delft ceramics. I guess my biggest takeaway from reading about 2013 decorating and interior design trends is this: Antiques are never out of style! Regardless of what the current trend seems to be, antique and vintage furnishings always have a place in your home’s decor. 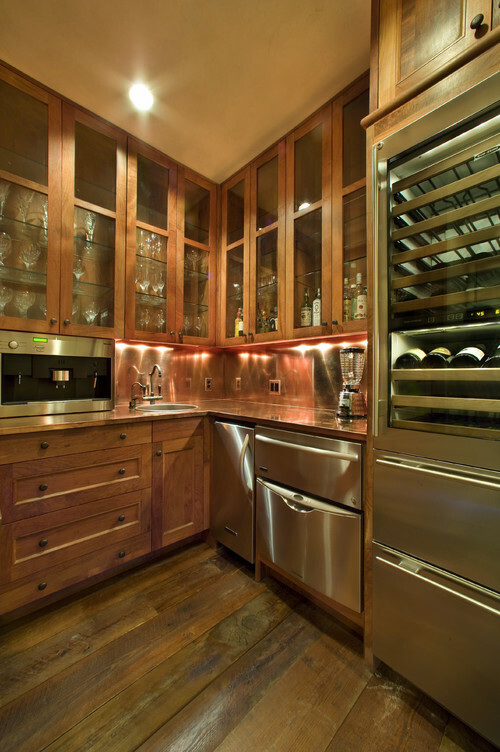 What do you think about the projected design trends for 2013? Do you pay any attention to trends? P.S. : Don’t forget: All of our photos are perfectly Pinnable! Delivered by FeedBurner. We respect your privacy. 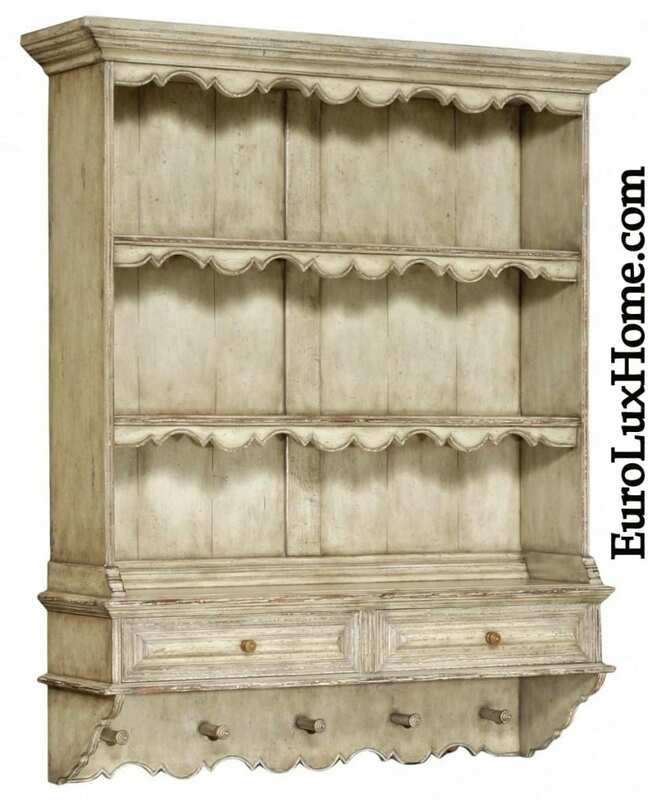 This entry was posted in Antique Furniture, Home Design Ideas and tagged 2013 design trends, Antique Furniture, antiques, Boston Design Center, color trends, home decorating trends, mid-century modern, trend report on December 11, 2012 by euroluxantiques.